One Goal. One City. One Lord Stanley Cup Win. I feel like I’ve been saying that all night. It keeps rolling around in my brain. The Blackhawks just won the Stanley Cup! WHAT?! My Blackhawks?!? 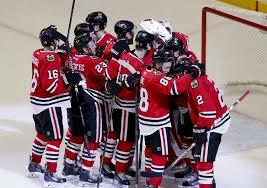 My black & red, my Toews, my Kane, my city, my heart, my joy & pain just won the ultimate game!!! THE BLACKHAWKS JUST WON THE STANLEY CUP!!! It feels like it was just yesterday I was so ridiculously upset the Blackhawks lost to the LA Kings in the Western Conference Final in June 2014. And then the season began and we struggled to stay in first place. And then I was at the Garden watching them take on the Bruins in December. And then Kane’s clavicle got knocked out of place and MY HEART COMPLETELY DROPPED! And throughout it all I’m texting my two Blackhawk-fanatic besties at home after every win, loss and headline. And now the season ends … with THIS! I still can’t comprehend it: 3 Stanley Cup wins in 6 seasons. My brain hurts. Corey Crawford went BEAST MODE!!! I love this team. I ABSOLUTELY LOVE THIS TEAM. Cue the Chelsea Dagger Chicago. WE WON THE CUP!!! Doing the best to be my best whole self!